After a wet snow, the sun is back out — Happy Spring! On the first day of spring, we reflect on how grateful we are. Our weather’s turned nice again, into the forties with sun. Will and David managed to haul more than 9 full truckloads of firewood logs home from the logging site before thawing started. 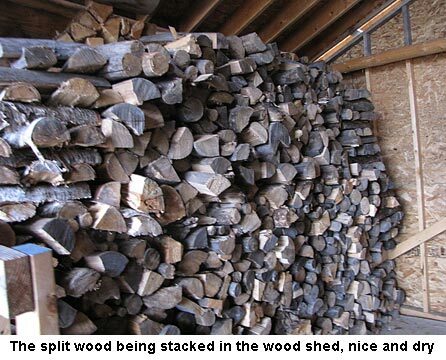 Will and I were able to cut up, split, AND stack away a whole cord, plus more into the wood shed. That’s a full cord, mind you (8’x4’x8′). Then it snowed and rained. Today Will’s out cutting up more logs to get ready to split as it’s again dry. We heard and saw a Canada goose yesterday morning. Yea! Spring’s really coming. No robins yet, though. Our chickens are starting to lay with the warmer weather again. I can’t wait for my first rhubarb pie, topped with four-egg-white meringue. I checked our fruit trees in the orchard and can’t see much, if any, winter damage or vole activity. We did have a very mild winter for northern Minnesota. We only hit -35 twice for a short time and we had plenty of snow cover. Wow, dandelions? Mine are still dormant, but I keep looking! Spring IS coming. A ROBIN???? Wow. I keep looking but haven’t seen one yet. You’re fortunate, indeed. Our old ladder was aluminium but plum worn out. The new one is fiberglass and aluminum and is so much steadier. Getting hurt is NOT worth the price of a new ladder for sure!! Another rhubarb lover here! Mine has small leaves, waiting for that first picking although I have a lot frozen. I have the Backwoods Home issue where Jackie is displaying the most gorgeous fresh baked rhubarb meringue pie and it is to drool over. Mine never look like that. I have a rhubarb bar recipe that is finger licking good when someone else bakes it – gooey and crunchy – never turns out quite right when I do it. Dandelions are good too and mine are at eating size. I prefer them cooked but a lot of people like them better raw. We saw our first robin yesterday! Spring is heading your way! This blog is one of your best ideas. It is so fun to see what you are doing. Happy spring to Jackie and Will. That free lumber is a God-send for your hard work. Can’t wait to see the new living room painted. Love to keep up with your blog. Get rid of those wood ladders! I banned them long ago when a employee took a spill on concrete floor. Permanent disabilities and temporary paralysis. fiberglass only here now. Vine trellises- that’s all they are good for! Jackie, many folks spring clean but painting the walls, that is really spring cleaning. A new coat of paint can really freshen up a place. You sure got my mouth watering with the mention of rhubarb meringue pie. I love rhubarb and can hardly wait too — pie, cobbler, muffins, even just stewed and drizzled with some cream. Yum.